Campaign of the year ….the fightback by disabled people as the Con/Dem Govt stripped some of the most ‘vulnerable’ sections of the community of their benefits. Their campaign against Atos (who made the decisions) during the Paralympics was inspiring and they have led the way in the fightback against the Con/Dem Govt. This is reposted from The Void with thanks. A well attended ceremony took place yesterday evening outside City Hall, London to make the opening of the Atos Games. 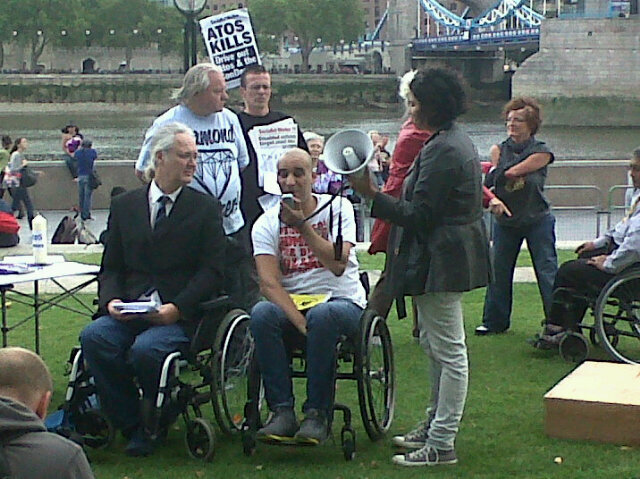 Disabled people and supporters held speeches and a mock medal ceremony to launch the Week of Action Against Atos timed to coincide with the Paralympic Games. Atos are paid £100 million a year to carry out the brutal and demeaning Work Capability Assessments on behalf of the Government. This short computer based health assessment has led to tens of thousands of sick and disabled people being stripped of vital benefits. Atos have recently won the contract to assess all those claiming Disability Living Allowance, a process which has the stated aim of removing financial support from a fifth of disabled people. Astonishingly Atos are also sponsors of the Olympics Games. At the mock ceremony last night, Paralympic Gold medal winner, Tara Flood was stripped of her medals as she was declared no longer disabled by Atos assessors. Speakers from Disabled People Against Cuts and Transport For All, who both helped organise the event, spoke of their experiences at the hands of the company and their fury at Atos attempting to gain positive publicity on the back of the Paralympic Games. Those assembled were warned that Paralympian Athletes will also soon face assessment by the company who have shown no mercy to even those with life threatening conditions. A recent investigation found that 32 people a week die after being judged ‘fit for work’ by the company. Atos were warned that we are coming for them – in the Courts, in Parliament, in the Courts and most importantly on the streets. Protests will take place around the UK outside Atos offices today as part of the Week of Action. A Mass Die In will take place in Cardiff on Wednesday whilst a Memorial Service will be held outside their London Headquarters on the same day. Like millions across the UK, I was inspired by the London 2012 Olympic Games. I decided I wanted to take family to the Paralympics to sample the once in a lifetime showcase of disabled sport in London. I am a wheelchair user, with a four-year-old autistic son and a nineteen-month-old baby. Naturally we wanted to sit together and, particularly as it’s the Paralympics, I assumed there would be adequate provision for this to happen. I was stunned to hear that there was no way that this could happen as there is a policy that wheelchair users can only be accompanied by one other person. I cannot believe that this event, designed to inspire a new generation of athletes, has a discriminatory ticketing policy. It’s essential that my husband sits with me as he helps me with things I need to do and clearly my kids can’t sit separately. Quite apart from these practical considerations, I want to share this special occasion with my family, but I’m being prevented from doing so just because I am in a wheelchair. Please join my campaign to get the organisers of the Paralympics to change this ticketing policy for these and future Games – so every family may share the Paralympics together. The sham that was Disability Capital 2011 (20th October at London Excel) reinforced the Government’s determination to set disability policy without any reference to disabled people ourselves and the reality of our day to day lives. Disabled People’s Organisations were markedly absent from the organisation and running of the event and those that did consider it worth attending went to protest. The aim of the day seemed to be to exclude and silence disabled people and to avoid those topics that we did want to hear about and question. Enough was however said to make it plainly obvious that the politicians responsible for setting current government policy are completely out of touch with the realities of disabled people’s existence. “we told the GLA if they had the conference at the Excel disabled people wouldn’t be able to get there but they didn’t listen”. Not only was the conference venue difficult to get to, the conference opened at 9am to start at 10am, leaving disabled people with a Freedom Pass just half an hour to travel across the capital in the post peak-time rush to get there for the keynote speeches. Moreover the main mode of transport to get to the venue, the DLR, was disrupted by non-operational lifts at many of the stations serving it. Worst of all, there was no lunch provided, leaving attendees to fend for themselves at the over-priced outlets in the Excel. It certainly appeared as if the GLA wanted to hold a Disability event without any disabled people being there. Those disabled people who did attend were restrained from asking difficult questions or getting our points of view across. 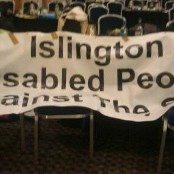 Security made Islington Disabled People Against Cuts take our banners down, and when we draped them across the empty chairs we were informed there were 1000 people booked to attend and all the seats were needed. Not even half that number showed up. Then there were the questions, hand-picked from ones submitted in advance. Both Transport for All and Inclusion London pre-publicised the range of pertinent questions they put forward to ask but the majority went unanswered. Not content to be silenced in this way, protestors heckled the Mayor of London and Minister for Disabled People, Maria Miller during their keynote speeches. This provided the entertainment for the day as politicians put on the spot revealed their levels of ignorance and prejudice. Mayor Boris Johnson showed himself completely out of touch with the concerns of disabled people. He thought we should be celebrating the 2012 Games, after all, some tickets are priced so extremely reasonably at under one hundred pounds. He told us that not only do disabled Londoners have the Games to look forward to, we also have the prospect of the South Bank, a veritable “party zone”, as he described it, bring made accessible. In future disabled people will theoretically be able to party freely in the Southbank. If only we had the income, the support and the transport to get there. Disabled members of the audience called out and heckled the Mayor about something called Atos. “Well, there’s clearly a lot of concern about Atos sponsoring the Paralympics” he conceded, “Why is Atos sponsoring the Paralympics? I don’t know”, he told us. “I’ll have to go and discover that from some learned quarter”. He promised that if people stopped heckling and let him finish, he would come back to questions from the floor, mainly about Atos, at the end. He didn’t of course. By the time the hand-picked advance questions had been covered, it was too late and he had to leave, although not before he enlightened us on such burning topics as “What bit of the Paralympics is the Mayor most looking forward to?”, and “What does the Mayor know about sickle cell” (cue patronising sympathy and a recited Wikipedia entry). So no, we never really got to the heart of the Mayor’s understanding of his government’s vicious erosion of disabled people’s rights. Maybe because he doesn’t have one or maybe because that’s what he would rather we believed. However he did promise that if we write in to City Hall after the conference with any questions that did not get answered he would receive a reply. After Mayor Boris came Maria Miller MP. She was vehement in her defence of the right of Deaf members of the audience to follow the conference and that meant all hecklers had to be quiet. 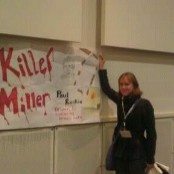 Never has a politician cared so much about the rights of the Deaf community as Ms Miller appeared to that morning. Suits in the audience felt emboldened to tell protesters to “shut up” so they could hear our venerable Minister speak as she painfully regurgitated the social model of disability and independent living philosophy as a justification for cutting services. Undaunted, the few disabled people in the audience called out “Lies, lies”. Finally, a hard-hitting question, about the target of reducing DLA claimants by 20%, was allowed through. 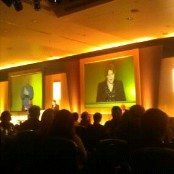 Maria Miller MP responded by telling the room that the majority of people on DLA do not have life-long conditions. She claimed it is in the interests of people with fluctuating conditions and those with learning disabilities, to be regularly reassessed. She never said why, or mentioned the cost of continuous review and reassessment, or explained how people with learning difficulties will be able to engage in the review process when their support packages are being slashed. And then it was time for her too to go. The Atos question was resurrected again in a subsequent session about the 2012 Games as a disabled member of the floor insisted that a question be posed about Atos sponsorship. (Of course this question had not been chosen from those sent in in advance as sufficiently interesting to be covered). Baronness Tanni Grey -Thompson explained that as the Welfare Reform Bill is currently at Committee stage it would be inappropriate for her to comment and would damage her credibility among her peers (pun intended). However only about 25 people had actually contacted her to raise concerns about Atos sponsorship of the Paralympic Games and if there are more people out there who are worried about it, by all means they should contact her and let her know.